Let's start with three different scenarios. Scenario 1: You have a number of employees who all have iPhones or iPads. They want to be able to access their work email on their personal devices and access internal services with a VPN. You are concerned about security of the devices and if a pass code would be present. You also have a number of Apps from the App Store that your company wants your end users to have access to to do their job effectivley. Scenario 2: Your boss just told you he wants to order iPads for all of your sales team so they can use them in the field for presentations, access to email and calendar, as well as a few apps. The devices will be assigned to a specific employee, and you would like them to be able to have a personalized experience on the device to promote a higher level of use and adoption. Scenario 3: You want to have a fleet of iPads in your organization to be accessible for your various teams to complete trainings. The devices will not be assigned to any specific users, and it's likely that a single user will use many of the devices. A single device, in this case, will have many different users. Let's tie these scenarios in with a deployment model. Scenario 1 is what is referred to as a Bring Your Own Device strategy or BYOD for short. The important identifier for this scenario is that the ownership of the device lies with the end user and not your organization. 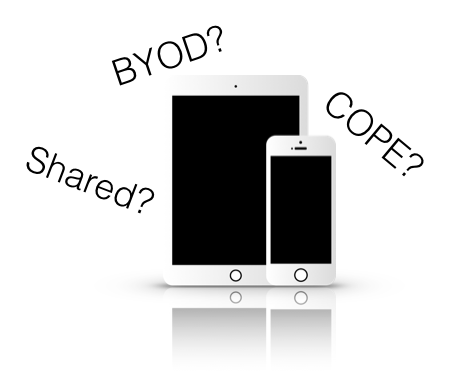 Whenever devices are owned by the end user, it is always a BYOD or partial BYOD strategy. Scenario 2 is called a Corporately Owned, Personally Enabled strategy, or COPE for short. This is because the ownership of the devices lies with the organization/business and not the end user. Personally Enabled means that the end user can use their personal Apple ID on the devices to get access to their personal content and provide a more personalized experience with the device. When these devices are managed properly, you can easily segregate corporate and personal data for a secure yet enjoyable experience for the end user. These devices are always assigned to a specific end user/employee. Scenario 3 is an example of a Shared deployment strategy. The key indicator here is that the ownership of the devices still lies with the company or organization. However, there are multiple end users. These devices are not assigned to a specific person, so there should absolutely be no Apple ID on the device. That is more than likely the case. These are just the three typical strategies that you can run into, and most companies have different technology initiatives or parts of their overall strategy that encompass one or even all of the strategies above depending on the use case. For instance, just the option of giving access to company email on your employees personal phones means that you have a BYOD strategy. Then, you may want to give each one of your sales guys their own iPads, but have a fleet of shared ones in the office for training purposes. We've made a slick guide that shows you how to determine your strategies for your different deployments. It also introduces some of the tools that you need to accomplish each strategy, and how those tools work together. You can download it below!